This issue’s back cover is even good. 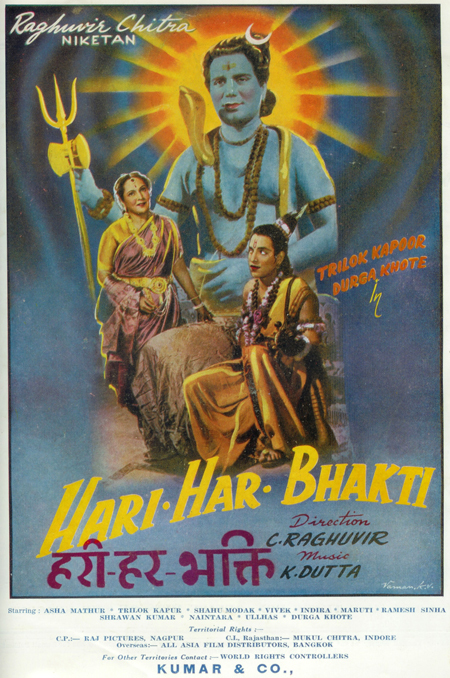 Something about the name Hari Har Bhakti makes me want to giggle. Hari Har Har, as it were. This is the back cover of another issue. I like how very small the priest is. More full-color portraits! I love Bina Rai, she is so very elegant. 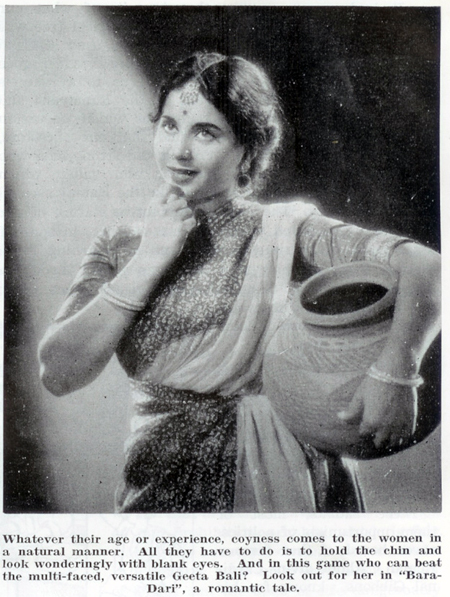 I haven’t seen Anita Guha in much, although I think she was pretty well-known for playing goddesses and such (hey that rhymes). Does that reek of sarcasm to you, too? …This picture…is a vivid school for crime and if the picture is followed by actual reports of criminals forcing their way into decent homes and making family members hostage till their criminal objectives are achieved, it should cause no surprise. If, therefore, our Censors are seriously interested in preventing propagation of crime through motion pictures, they must bad this picture straightway as a matter of sacred duty. And the Censors must remember that it is exactly these kinds of pictures which have today reduced America to a vast, stinking swamp of crime…[it] is one large celluloid pill of social poison…and must be banned by the Censors without the least hesitation. History and factuality have no use for Hollywood except when they can fit into Hollywood’s dirty patterns of entertainment and can be exploited to cater vice, lust, greed, violence and other sordid ingredients on the screen…Hollywood is ever ready to distort history, twist facts, rewrite scriptures, pervert truth and slander nations…This sordid story of greed, violence and treachery is no edifying entertainment and deserves to be banned. One gets the feeling from his reviews that he watches these “must be banned” films with a great deal of glee. Posted on August 7, 2009 at 5:30 pm in Baburao Patel's Poisonous Pen, Hindi film history, Hindi movies, Vintage Bollywood images	| RSS feed You can skip to the end and leave a reply. Thanks as always for sharing these rarities. The cover is beautiful. The reviews, interesting. I wonder which of any Hollywood pictures he liked? Speaking of Hollywood, I have not seen Kuldip Kaur before, but in that picture she looks something like the actress Rosalind Russell inher young days. Geeta Bali looks like Isabella Rosselini to me in that picture. Barburao – yeeps, I still think. I don’t know what he really means. Yes, she does that too :) I mostly think Baburao likes keeping people off-balance, and he’s very good at it! Re: ” I like how very small the priest is.” lol. The priest is supposed to be in the distance. Anita Guha was in Goonj Uthi Shehnai. These posters make me want to live in those times. Vasvadatta ! wow ! I read that story in school. I love the posters. So beautiful! They make me want to run out and see the movie, which I guess is the point of film posters. So—yay! beautiful AND effective! Kamal Kapoor looks almost like Raj Kumar. His striking personality was used well later as a Bad Man or a Police Officer. Is Kanwal Kapoor above the same person? I am familiar with Kamal Kapoor, but not Kanwal…I can’t tell by that picture if they are the same, since it’s in profile. Both the Anita Guha films I remember seeing were comedies – and pretty good ones at that: Dekh Kabira Roya and Mud mud ke na Dekh (which starred, to my dissatisfaction, Bharatbhushan – it was also Prem Chopra’s debut film). And I get the feeling Baburao’s being pretty sarcastic re: Hollywood. “But bad and dangerous pictures have to be pointed out to save our people from becoming degenerate and demoralised members of society.” – that sounds just to sanctimonious for Baburao to be serious! That’s my feeling about it too, except that sometimes he sounds very serious! :-) Nevertheless, love him! I need to see Dekh Kabira Roya—it has been coming up a lot in discussions lately for me! Geeta Bali looks great in that screen cap. Thanks for sharing the pics. I think Anita Guha is more famous for her Goddess role in Jai Santoshi Mata if i am not mistaken. I can see, quite easily, how this inspires you to write when you’re not in the mood. 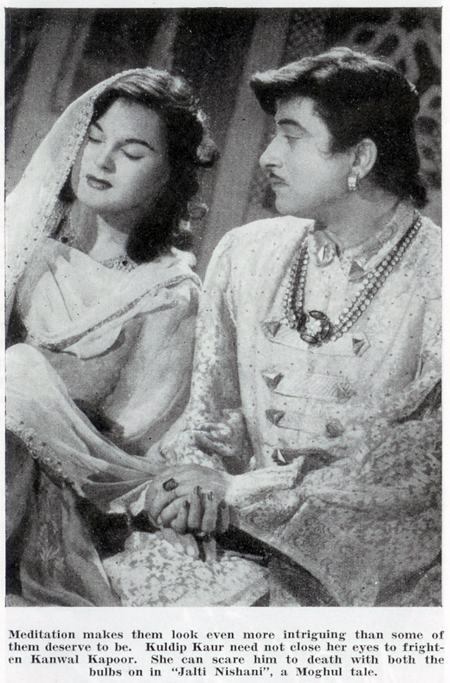 I think I’ll force myself to finish that long over-due review on Mughal-E-Azam I’ve been meaning to get to. I’m dying to see what you’ll have to say about the king with a penchant for great variety in entertainment to suit his suddenly changeable moods. LOL! I bought this DVD when last you posted pictures of Insaaniyat from Filmindia, and thought – ** a film with both Dileep and Devanand!!!? ** How can I miss that? I saw it a month ago or so (also because of the Filmindia covers!) and mostly what I remember is how very awesome the chimp was! He totally stole the show from Dev Anand AND Dilip Kumar! I want to see Vasavadatta! 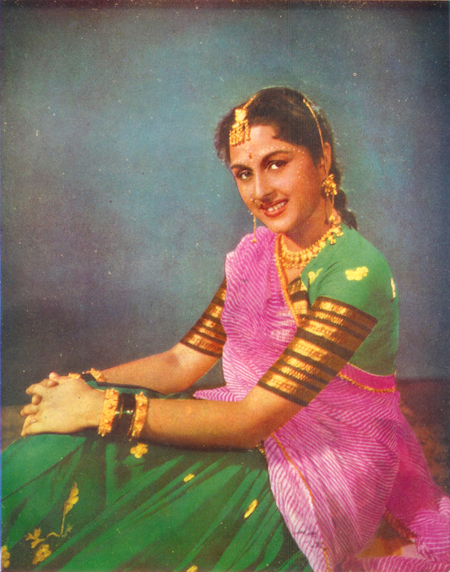 Wonder why it was shelved…:-( Vaiju in an Amarpali type role in the 50s dancing to C. Ramchandra’s tunes…heaven. 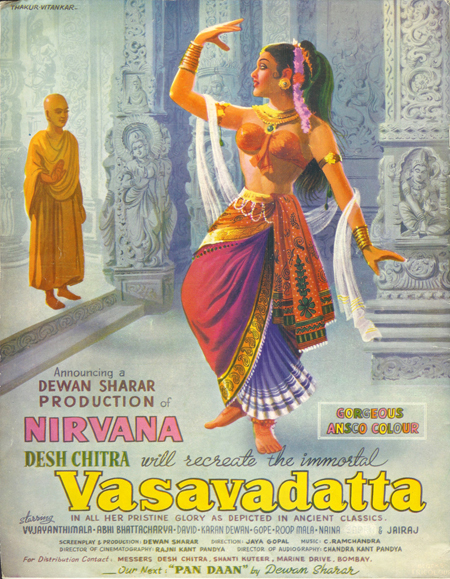 Wow – never heard of that movie Vasavadatta / Nirvana (what the heck is it called – can’t really tell from the poster!) I wonder if it was ever released – anyone have any info? Hello My Good Friend. How are you today? i hope you are fine,well to me i am Ok,my name is Miss mary Badu ,i saw your lovely profile ,and become interested in you please can you kindly write and tell me more about yourself, here is my email address (mymary66@yahoo.com). I will be delighted if my request for a friendly relationship is granted. My special hobbies includes,reading literature,swimming,cooking,watching movies and travelling. Remember race,colour and distance is not a barrier to love. Hi Miss Mary :-) I am glad you enjoy the blog, please do keep visiting! 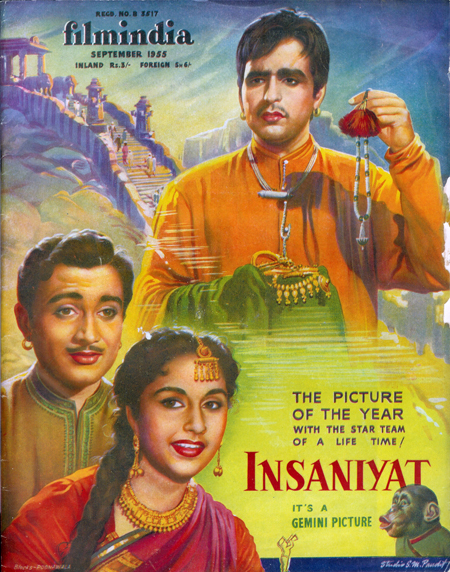 INSANIYAT did have some good songs tuned by C Ramchandra. 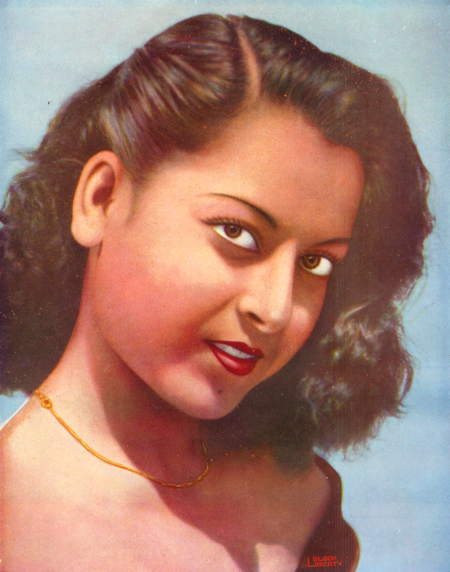 About Kuldip Kaur- I recently saw her in Baaz (with Guru Dutt and Geeta Bali). I think she was an amazingly beautiful actress. Agree fully re: Kuldip—I am always happy to see her, she livens things up!